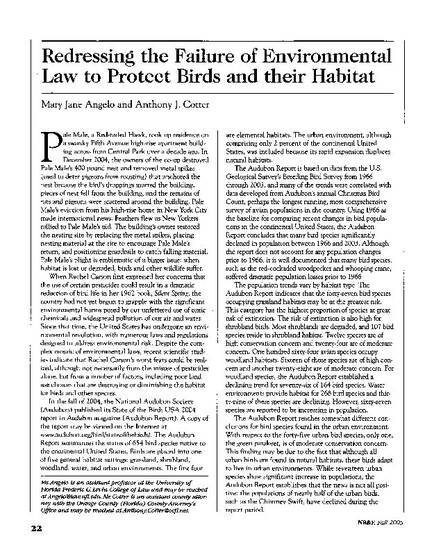 The Audubon Report indicates that the forty-seven bird species occupying grassland habitats may be at the greatest risk. This category has the highest proportion of species at great risk of extinction. The risk of extinction is also high for shrubland birds. Most shrublands are degraded, and 107 bird species reside in shrubland habitat. Twelve species are of high conservation concern and twenty-four are of moderate concern. One hundred sixty-four avian species occupy woodland habitats. Sixteen of those species are of high concern and another twenty-eight are of moderate concern. For woodland species, the Audubon Report established a declining trend for seventy-six of 164 bird species. Water environments provide habitat for 268 bird species and thirty-nine of these species are declining. However, sixty-seven species are reported to be increasing in population. The Audubon Report reaches somewhat different conclusions for bird species found in the urban environment. With respect to the forty-five urban bird species, only one, the green parakeet, is of moderate conservation concern. This finding may be due to the fact that although all urban birds are found in natural habitats, these birds adapt to live in urban environments. While seventeen urban species show significant increase in populations, the Audubon Report establishes that the news is not all positive; the populations of nearly half of the urban birds, such as the Chimney Swift, have declined during the report period. In addition to the Audubon Report, another significant study on the decline of bird species conducted by researchers at Stanford University was published in the Proceedings of the National Academy of Sciences in 2004. This study predicts that by 2100, 10 percent of all bird species are likely to disappear and another 15 percent could be on the brink of extinction.